The Sony a6300 and Canon EOS 80D are visually very different cameras. 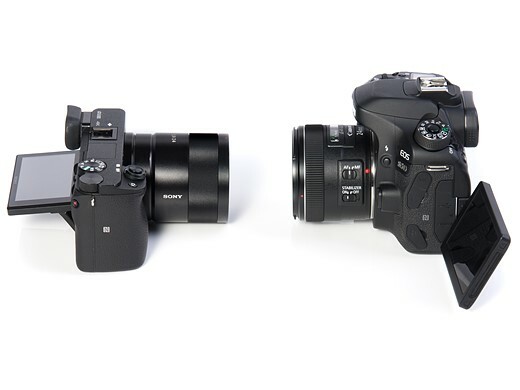 One looks like Canon DSLRs always have, the other looks a lot like Sony’s original NEX line of mirrorless cameras. 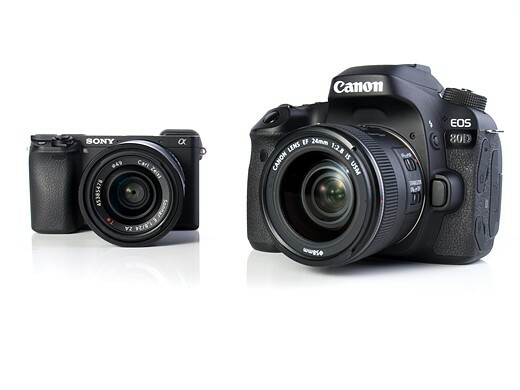 Some of the differences between the cameras come down to the fact that one is a DSLR while the other is mirrorless. 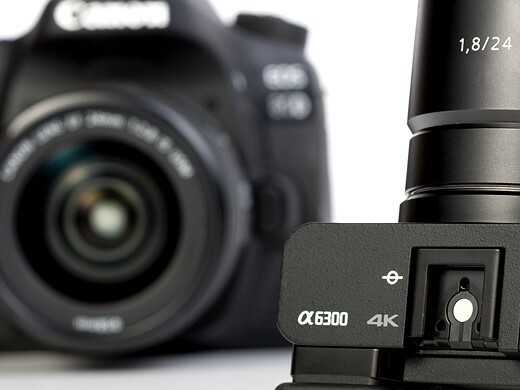 No matter how much technology closes the gap in performance between the two systems, the DSLR structure allows the provision of a TTL optical viewfinder, while a mirrorless camera is more likely to include an electronic viewfinder. Many people, in part as a consequence of familiarity, prefer an optical viewfinder, but there are advantages to each approach. The a6300’s viewfinder is able to show a corrected preview when working with the super-flat S-Log gamma profiles, as well as being able to overlay focus peaking and exposure warnings into its viewfinder, in a way that can’t be done with an optical viewfinder. This is on top of the ability to visualize the exposure and white balance of the final image. Finally, an electronic viewfinder need not be constrained by the size of the sensor format, as the optical view of a DSLR’s mirror is. In this instance, the a6300’s finder is around 20% larger than that of the Canon. Its fast refresh means it’s better able to help you follow the action than ever before. However, one of the traditional advantages of a mirrorless camera is that they can be smaller and the a6300 certainly has the edge in that respect. Its kit zoom may not be the best-loved or most consistent lens on the market, but it does a great job of keeping the size of the overall package down. There’s a well worn adage that the best camera is the one you have with you and all but the most dedicated photographers are likely to find the a6300 much more convenient to carry with them. Disregarding macho nonsense about carrying the weight of a DSLR, the a6300’s much smaller form factor may well be the difference between you keeping a camera with you and only bringing it along when you expect to need it. That said, the 80D’s optical viewfinder means it doesn’t have to have its screen on all the time. This certainly helps towards it having a CIPA battery rating 2.4x greater than the Sony (960 shots per charge, vs 400 on the Sony or 350 through the electronic viewfinder). 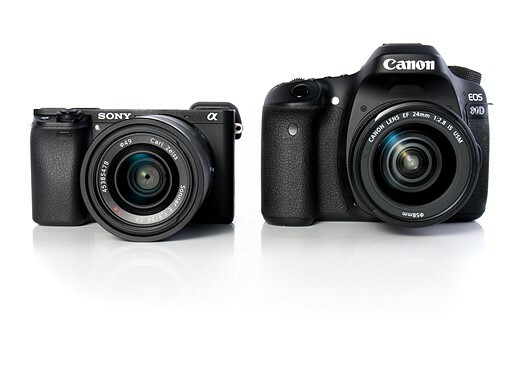 Some of the differences between the two cameras don’t directly stem from the DSLR/mirrorless distinction. There are plenty of mirrorless cameras that offer DSLR-like control points, but the a6300 doesn’t follow that path. While Sony has increasingly stepped away from its innovative but simplistic NEX interface, the a6300 doesn’t offer the level of at-your-fingertips control that you’d usually get for this much money. There are two command dials but both of them are operated with the same digit, and the one on the rear face of the camera requires you to move your hand out of a shooting grip (which makes it unnecessarily fiddly). The camera does at least give plenty of customization of its buttons and Fn menu, so you can choose which options to get fast and semi-fast access to, but there remain features we want access to that are unassignable, and we’ve sometimes found ourselves running out of assignable buttons. I don’t think even its most strident supporter would consider the a6300’s handling to be amongst its strengths. By contrast, the Canon does a great job of blending its well-worn stills control layout with a simple but effective level of touchscreen control, making the 80D a much more engaging and direct-feeling camera to shoot with. Yes, it’s very traditional approach, but it works well for stills and has been adapted pretty well for shooting video, too. And I doubt many people would have guessed that it’d be Canon, rather than Sony, that brought touchscreens to its enthusiast cameras first. The days of being able to simply say ‘DSLRs are better at focusing’ is long gone, but that isn’t to say that all cameras are now equal – different technologies have different areas of strength. The EOS 80D’s through-the-viewfinder focus is generally good when shooting approaching subjects but seems to struggle at the camera’s highest frame rate. The hit rate falls further if the camera has to track subjects moving around the frame. Like most DSLRs, it can also exhibit some focus imprecision on close-up, shallow depth-of-field photos. 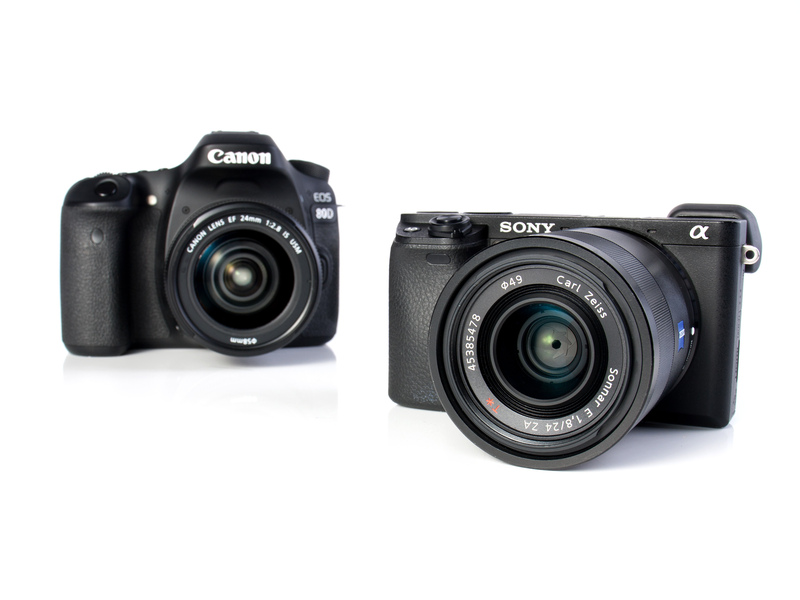 By comparison, the a6300 offers excellent autofocus in a lot of circumstances. Its subject tracking is generally very good and will follow a single, clearly defined subject around the frame as it moves, though it’s not reliable enough to use in lieu of manually positioning the AF point over a subject. This is a pity because, without a touchscreen or joystick, the manual positioning of an AF point is rather slow and clunky. Eye AF, which you’ll need to assign to a custom button to gain access to, is superb though. Point the camera at your subject, hold down the Eye AF button and the camera will generally stick to its target well, even as you and your subject move around. It’s particularly good with fast primes where you can be fairly confident of your subject’s eye being perfectly sharp. That said, it’s not without its limitations, jumping off to other subjects from time to time. However, the EOS 80D is based around a Dual Pixel AF sensor, which means it can offer depth-aware phase detection autofocus across much of its sensor if you’re willing to use the rear LCD and shoot in Live View. This is especially good at identifying and following faces (or other objects) within the scene, meaning it can compete pretty effectively with the a6300’s Eye AF mode, even with a fast prime lens. What really sets the two cameras apart is their approach to video. Not just in terms of specifications, but how you shoot. The Sony has the upper-hand on paper, since it can shoot 4K video, but it’s not as simple as all that. The a6300 is very well equipped when it comes to video. It can shoot UHD 4K at up to 100 Mbps. It includes adjustable zebra patterns for helping you set exposure. It also includes focus peaking and during-capture magnification to help you confirm and adjust focus, and it also offers a huge variety of video-centric gamma responses including Log curves and a mode that gives an ITU 709 preview while shooting log. Which is lovely, if you know how to make use of all of those things. And knee, and master pedestal. But, while it can be fun to learn, it’s a little daunting at first. Of course you can ignore these options and shoot autofocus if you want but, while good, AF is not immune from refocusing off to infinity. And, without a touch screen, moving the focus point is impractical. The Sony can sometimes, especially in warm conditions, overheat before reaching its 29:59 limit. This and the more involved shooting technique needed to get the very best from the its frankly stunning 4K quality means isn’t suited to every type of shooting. Its 1080 is also oddly disappointing. But if you put in the work, it’s sensational. The EOS 80D is a really interesting camera, when it comes to video, and its limitation to 1080 shouldn’t see you write it off. The Canon can’t compete with the Sony’s video quality or its laundry list of support features. But what it does offer are simple autofocus and ease-of-use. The 80D’s dual pixel autofocus really comes into its own for video shooting. Touch on the screen and the camera will refocus with absolute confidence. Set a target and the camera will keep your subject in focus. You can dictate the focus speed and be confident that the camera will do what you want, without the constant wobble or occasional catastrophic mis-focus that most of its rivals will deliver. Of course, being a DSLR, you can’t resort to using the viewfinder when it’s bright outside. The footage isn’t great, even by the standards of 1080 video, but it’s more than usable and is just so easy to shoot. 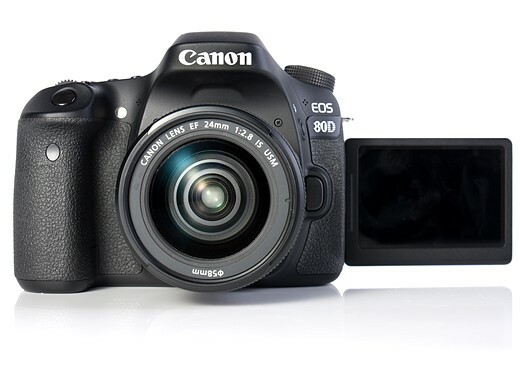 The lack of exposure monitoring tools is also a pain, but overall, the 80D a great camera for stills shooters who want to shoot video without having to learn how. While Canon’s APS-C lineup isn’t quite as comprehensive as its offerings for full frame, it’s still pretty comprehensive, especially when you include those full frame lenses that remain useful on the smaller format. The native APS-C range includes a variety of zooms at different price levels, an a 24mm F2.8 STM prime if you’re trying to keep the overall size down. 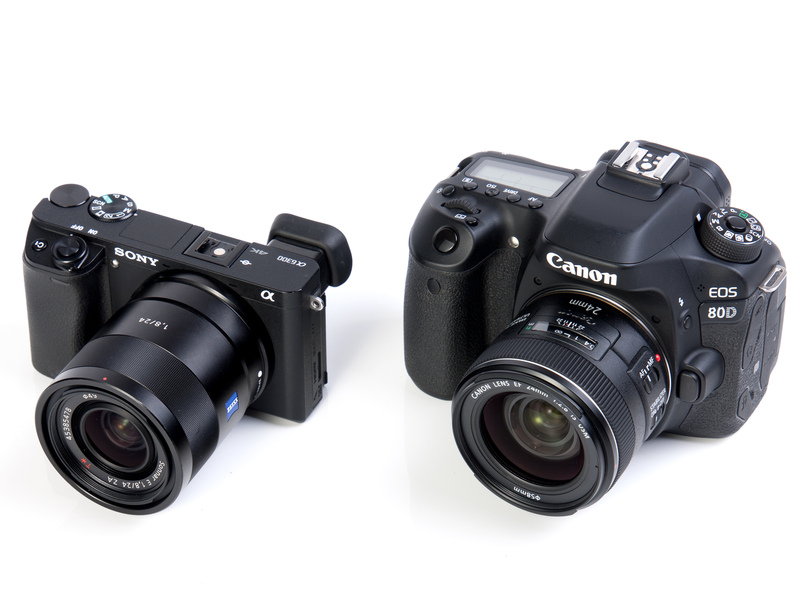 The same can’t be said for Sony’s E-mount lineup. There are some useful lenses, including stabilized 35 and 50mm primes for APS-C and a 28mm F2 that makes an effective normal, but it’s certainly worth checking that the lenses you need exist, affordably, in the Sony range before you commit to the system. That said, the short flange-back distance of the E-mount means that all sorts of lenses can be adapted to work on the Sony (some of them with AF), which is especially valuable for video work. It might seem tempting to draw the conclusion that you buy the Sony for video and the Canon for stills, but it’s not quite that clear-cut. 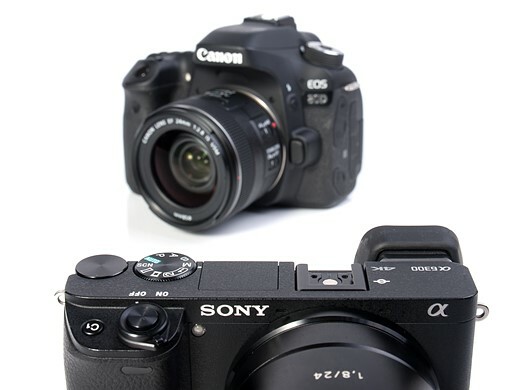 The ease of shooting video with the Canon, along with the very capable autofocus of the Sony mean that both cameras have something to offer in what you might otherwise assume to be the other’s areas of strength. The a6300 has a slight edge in terms of image quality and huge advantage in terms of video quality. 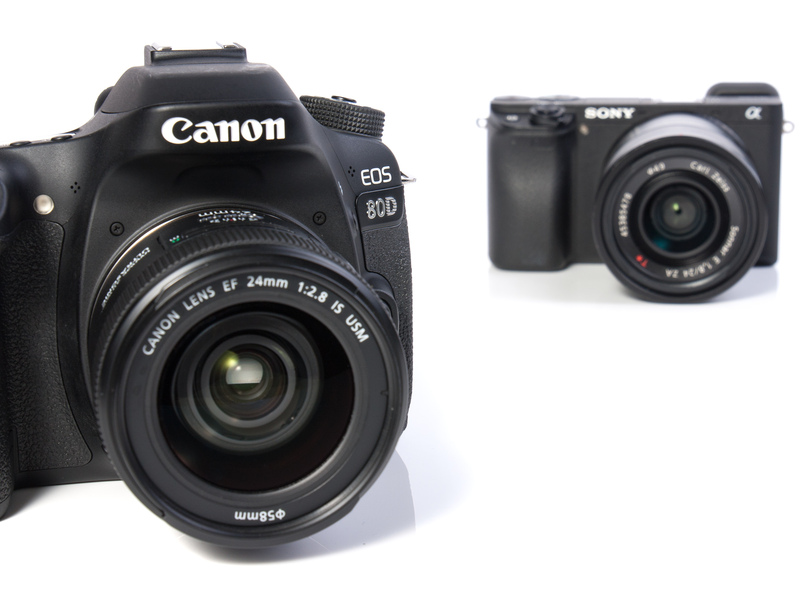 However, the EOS 80D is undeniably a more enjoyable camera to shoot with. It would be hard to choose a winner in terms of autofocus (heretically it’s the 80D’s live view AF that keeps it in the hunt), meaning a lot of it comes down to personal priorities. If you want probably the most capable camera that’s easy to keep with you, then the Sony is the easy choice. But if you want a more traditional or hands-on shooting experience and still want some of that stills/video flexibility, then the Canon might be the better choice. Yet again, the simple idea that most modern cameras are great is true. But that doesn’t mean they’ll all be equally good for you.